Many pharma critics argue that drug companies skimp on research while earning outsize revenues–but a new analysis my colleague and I just published tells a more nuanced story. First, some background. Journalists and academics often point to the fraction of revenues that drug companies spend on research versus “sales, general and administrative” (SG&A) expenses as evidence that pharma underfunds research. But as Derek Lowe (here, here) and others have noted, these analyses provide zero insight into whether spending in each category is too high, too low or just right. Just as households need to spend money on food and utilities, pharma companies need to pay for both SG&A (which includes not just commercial expenses, but also corporate infrastructure) and R&D, and it’s impossible to say a priori which should be a larger fraction of top-line revenues. Instead, it's more pertinent to ask about how the growth rates of R&D, SG&A and revenue are related. I think many critics and lay readers would reflexively assume that even when adjusted for inflation, pharma's revenues have increased year over year, while R&D spending may have stayed constant or even declined. Another common belief among critics is that when times get tough in pharma, R&D is the first thing to get slashed–but in fact, that appears to be an oversimplification as well. We looked specifically at instances when a company’s revenue declined by more than 5% (inflation-adjusted) and asked how the drugmaker responded in the following year. 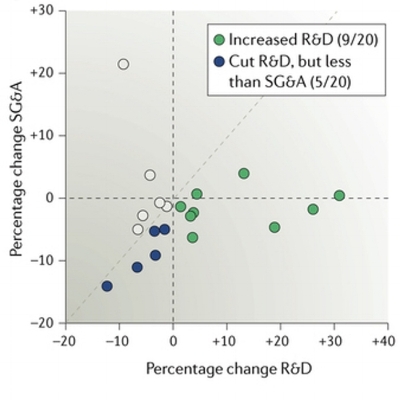 Even in the face of steep revenue drops, R&D mostly either increased (9/20) or decreased by a lesser percentage than SG&A (5/20), suggesting that companies often strive to protect R&D even in the face of acute financial pressure. Importantly, that last point counters not just a dominant narrative from pharma critics, but also one of the industry’s key arguments against price controls. Price hikes are a major driver of pharma revenue growth, and it’s hard to predict what might happen to the biopharma ecosystem if that growth were constrained. However, these data suggest that large drugmakers are generally committed to sustaining R&D, and many manage to grow research spending even in the face of both acute and longer-term revenue declines. In other words, pharma’s R&D spending may be more strategic than algorithmic, and the simple assumption that lower revenue growth would lead companies to invest less in drug research may not be entirely accurate. Slopes of best-fit lines for inflation-adjusted and normalized R&D spending, SG&A costs and revenues, 2005-2015. See text and original paper for details. Thanks to Chris Franco (Takeda) and Scott Innis (Biogen) for input on drafts of the research cited here. Feel free to email me with questions or for a copy of the article. ... and a free bonus chapter from our book: Projecting Market Share for R&D-Stage Biotechs - just enter your email below! Just one more step ... Please look for an email from us and confirm your subscription. Get hot-off-the-presses research updates and a free chapter from our biotech finance book! Just one more step ... Please look for an email from us and confirm your address.